A tiered system of supports (also called Multi-Tiered System of Supports or MTSS) is an umbrella framework that includes Response to Intervention (RTI), Positive Behavioral Intervention and Supports (PBIS) and Universal Design for Learning (UDL). 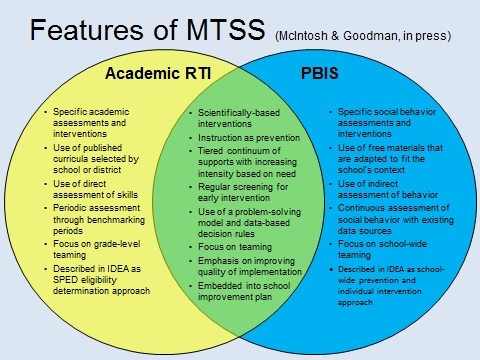 MTSS is a data-based, problem-solving framework that integrates instruction, intervention, and assessment to meet the academic and behavior needs of all students. It is designed to provide multiple levels of support for all students, including those with disabilities and at risk, to close achievement gaps. MTSS provides universal academic and behavioral instruction and support to all students (Tier 1), adds targeted support/instruction as needed (Tier 2), and intensive, individualized support/instruction as needed (Tier 3). All levels of support are aligned with the universal core academic and behavior instruction and support that is a baseline for all students. This framework focuses on prevention as well as intervention.